In warfare, capturing an objective is theoretically simple; holding it is not. This principle was applied to the defense of Corellia's Coronet City with the creation of the Guardian Holds. Key sites were carefully chosen--manufacturing centers, easily fortified buildings, hospitals and underground bunkers. These sites were then furnished with heavy defenses, armaments and elite Republic troops. 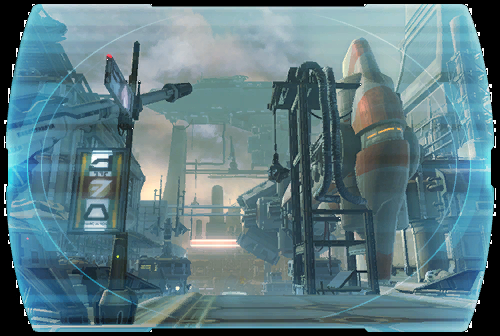 In the event that Coronet City was sacked or captured, these impenetrable Guardian Holds would become fortresses from which the Republic could retake the city. The number and locations of the Guardian Holds is a closely-guarded secret held by the Republic's military leaders and the Jedi Council. Some have questioned why so much expense has been invested specifically in protecting Corellia. The fact is that Corellia has strategic, economic and symbolic value to the Republic; the effort involved in the creation of the Guardian Holds only serves as evidence of the planet's importance.